Ever been stopped in your tracks by the sheer beauty of an orc? Have you ever been compelled to pause and ponder their captivating and inspiring nature? Have you ever thought of how thankful you and the rest of the world should be for their particular flavor of loveliness? Of course, I’m not talking about physical comeliness or attractiveness here. Orcs aren’t exactly that kind of beautiful. But they are beautiful. And very much so. They are beautiful in their unique ability to play very specific roles and, in doing so, serve very specific, important, and beautiful purposes. They help to compose the black backdrop against which the brightest gems of truth might shine, and that is no small thing. It is very big and it is very beautiful. So why are creatures such as orcs treated so rudely? Why do they get such short shrift? Well, for some, the mere fact that they are fictional creatures is enough to justify ignoring them. That is a shame, but at least an understandable shame at some level. We are inclined to fear that which we do not understand and, even more seriously (and properly), good Christians are rightly inclined to err on the side of caution where things like orcs are concerned. This erring on the side of caution is a good practice in general, and I am not about to argue against it here. I only hope to gently nudge and shed some light that might be helpful to such good, serious Christian folks as to the possible beauty and usefulness of things like orcs. Another reason for aversion to even acknowledging, much less embracing, the beauty of the orc is that orcs tend to portray darker elements in a story. They are bad guys, and bad guys are, well…bad. This too tends to have many perfectly good, serious, and wise Christians reach for the off switch where orc consideration is concerned. Again, I respect this approach and only hope to inspire here a consideration of the potential purpose and beauty of fantastic fictional bad guys like orcs. As has been noted and rightly repeated by many far brighter and better writers, context is to language what location is to real estate. Put another way: Context is everything…or nearly so. The context in which an orc is indeed beautiful is one in which it is effectively used to aid in the presentation of what I will call here “the black backdrop” of a story. The black backdrop is the reality of darkness and challenge; particularly an active challenge to that which is light and good. Since all true pieces of any representations of such light or goodness are only as true or good as they are true to the nature of Christ as revealed in His Word, we have in Scripture the standard by which to evaluate and test all fictional presentations of light and goodness. The same Scripture informs us as to what is and what is not an accurate representation of darkness and rebellion against the Light that is Christ. So it is in both Scripture and the world in which we live that we see plainly that God – the perfect Author of everything including art, language, and drama – has been pleased to craft and use “the black backdrop” concept in order to tell His perfect (and supremely dramatic) story and against which to highlight and display the matchless beauty of the Gospel. God raises Pharaoh up, and He puts Pharaoh down. God raises and puts down empires. He uses these people and things as He pleases, when He pleases, to accomplish His purposes…and perfectly so. So it is that the best dramatic art requires some form of “the black backdrop”. The best drama requires this approach because it is the models God’s crafting and use of drama throughout His creation. Apparently (based on His use of it), this is the best way to present what He wants presented in His creation. As it is His preferred mode of dramatic revelation within His creation of time, we should not be the least little bit surprised that we, who are made in His image, would aim to craft dramatic art in a similar manner. So bring on the orcs! So long as they are presented in a proper, God-glorifying context (which I hope to try to at least begin to define in a future post), orcs, dragons, trolls, and the like can indeed be beautiful. In The Lord of the Rings, a book/film combo that has helped to shape Western culture in recent generations, orcs play a prominent role. They are hideous, vile, evil, and destructive. And there are armies of them. The good guys in The Lord of the Rings wade into and through these vulgar forces of general disgustingness on a fairly regular basis. They meet them here and there, on this battlefield and that, and they wade into them, lopping them to pieces or running ’em through with swords, hammers, axes, spears and arrows. Whenever the good guys encounter these vile creatures, they pretty much do whatever they can to slaughter them. Is it because these orc are physically ugly? Perhaps it’s their poor etiquette and terrible table manners? Nah, though I do not doubt that those are contributing factors. They are slaughtered on site because they…are…evil. Incontrovertibly, unwaveringly, and unsalvageably evil. Their very nature is to destroy through their inherent hatred of rebellion against all that it right and good. They’re self-absorbed, self-serving, and inherently destructive. They are evil by nature. You know, like you and me before we were supernaturally saved by the grace of God through His Gospel. They are us as we were. We were once as self-absorbed and inherently destructive as they are, and we deserved to be slaughtered just as they deserve to be slaughtered. We deserved righteous justice the likes of which they routinely receive at the hands of the good guys in The Lord of the Rings. So do you see it now? The beauty of the orc, I mean. 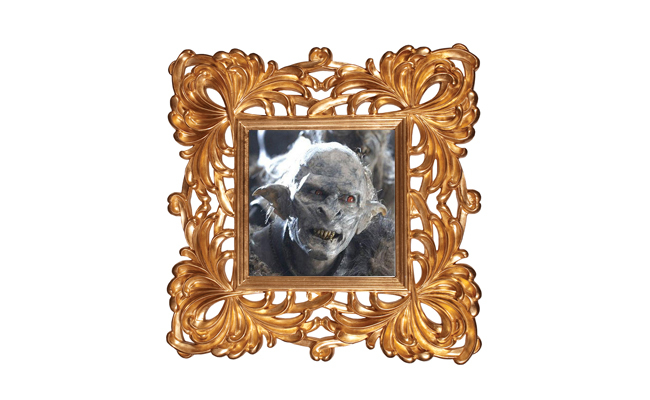 More specifically, the beauty of the ugliness of the orc. Or even more specifically, the ugliness of unrepentant humanity. That’s what orcs picture. They’s what they represent. And they do it very well, don’t you think? Their ugliness is our ugliness before we were supernaturally saved by the grace of the very God we actively hated and rebelled against at every opportunity by our very nature. That’s what the unrepentant lost are now. And if those lost do not repent, believe, and find salvation through loving submission to the King, He will bring justice to them in a way and on a level not possible to capture or comprehend in the most fantastic of fantasy fiction. The Gospel command to repent, believe, and be saved is no small thing. It is a great thing; a most important thing. Things like orcs can greatly help to explain why that is so. They can help to explain and remind us of our ugliness apart from the supernatural intervention of God. Cherie c. Not Cherish c.